Riding on a stationary bike can be a way to improve technique when pedaling a bicycle outdoors. Stationary bikes are used to exercise in indoor cycling classes. Indoor cycling refers to riding a stationary bicycle at home or at the gym. Stationary bikes provide an excellent aerobic and lower body workout, and may be ridden independently, or as part of a class. These indoor cycling classes are often called spinning classes, and are quite popular in many gyms. Most stationary bicycles allow the user to sit forward, as if he or she were riding a traditional bike, or to stand up and lean over the handlebars. Other stationary bikes feature a seat onto which the user can lean back. The stationary bikes typically found in an indoor cycling class are usually the former; participants are encouraged to stand up on their bicycles for most of the class to get the most benefits over the entire body. 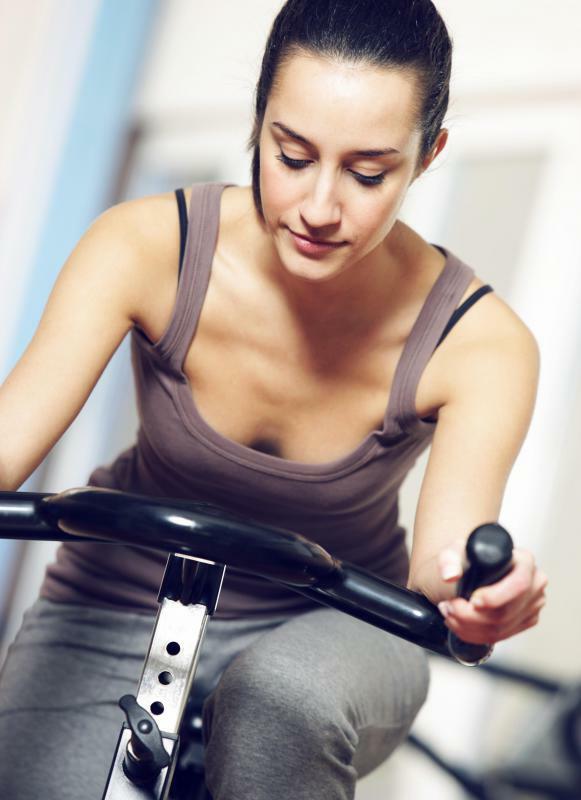 Indoor cycling can be very challenging, but is much safer than riding outdoors. The user may often adjust the incline on the stationary bike, making it more difficult to press the pedals, which leads to a more challenging workout. In addition, there is no concern about the weather when using a stationary bicycle, and the risk of injury is quite low as compared to riding a bicycle outside. It is very easy to get an excellent workout on a stationary bicycle on one's own. Simply warm up for a few minutes with the bicycle on a relatively low resistance or incline setting, then increase the incline and ride the bicycle for 20 to 30 minutes for the most aerobic benefits. End with a cool down period and some stretching. It might be beneficial to vary the resistance while riding to prevent becoming bored, and to challenge the body. 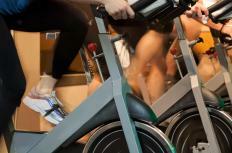 If the energy of a group class is preferred, sign up for an indoor cycling class at a gym. In this type of class, an instructor will sit on a stationary bike at the front of the room facing the class, all of whom are also on stationary bikes. Loud music will typically play while the instructor shouts out instructions, and encourages the students to visualize a bike ride; for instance, the instructor might tell students that they are going up a steep hill, and to increase the incline on their bikes and stand up. Students may be able to exercise for a longer period when they are part of a group class, and it may also help them to push themselves harder than they would on their own. How Do I Become a Spinning® Instructor? What is an Indoor Rower? What are the Different Types of Cycling Equipment?